The Data Services tab contains list of all data services on the Server. The button in the left column serves to enable ( ) or disable ( ) the service (e.g. temporary disable due to maintenance). A disabled Data Service returns the HTTP status code 503. In the second column, there are Endpoint title, method(s) and a part of endpoint URL. - The Data Service does not require authentication. - The Data Service saves the job execution record in Execution History. - The Data Service is marked as failing. - The Data Service is available on HTTPS. The third and fourth columns contain query statistics. 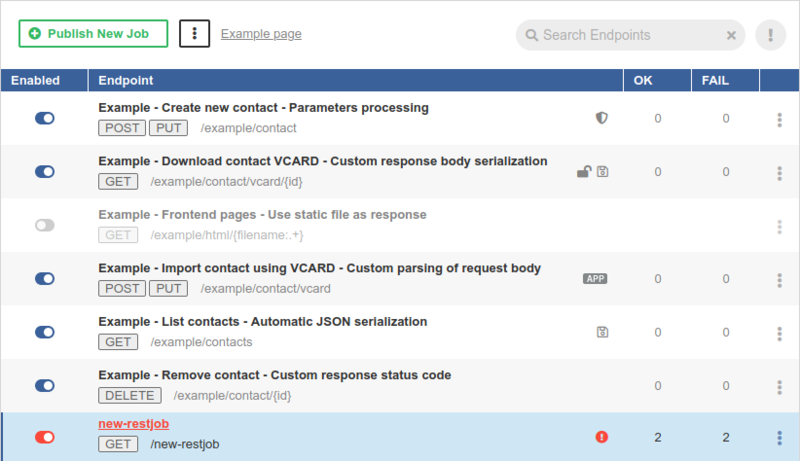 The last column contains a menu with Data Service actions Unpublish and Reset Endpoint State.